LOUIS HAROLD (HAL) GRAY was not a product of his times; that is to say he was no opportunist who cleverly adapted his talents to the current circumstances. Rather he was a maker of scientific history and his genius would have been as apparent in any other age. Particularly would he have been at home in London three centuries earlier. It has been recorded that the beginnings of the Royal Society stemmed from the urge in 'a small group of learned men who were interested in the Experimental, or New Philosophy as it was then called . . . to meet occasionally in London for talk and discussions at the lodgings of one of their number'. 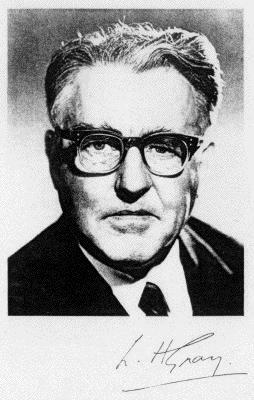 The urge to meet with his fellow men for their mutual benefit by discussion of matters of science was characteristic also of Hal Gray. The New Philosophy which some would now equate with the scientific method owed much in England to Francis Bacon (one time of Trinity College, Cambridge) and would have delighted a seventeenth-century Gray. It was the natural revolution of the Renaissance period against medieval dogma and the confinement of formalistic scholasticism. Further the New Philosophy was not subject-limited, and its exponents considered and discussed Physick, Anatomy, Geometry, Astronomy, Navigation, Statistics, Magnetics, Chymicks and Natural Experiments. The twentieth-century Gray (also a product of Trinity College, Cambridge) was reared in an age when the cult of specialisation for learning more and more about less and less was at its most fashionable. Gray and the few others of his ilk by some instinctive process foresaw that escape from this confinement depended on those with sufficient breadth of understanding somehow encompassing the new philosophies of the the twentieth century and synthesising the advances of physical, chemical and biological sciences into new concepts. In the process new disciplines are defined and named. This process the superficial reviewer might mistake for fission of accepted branches of science, whereas in fact fusion has occurred. Radiobiology and molecular biology are cases in point and Gray was the Fellow who fathered radiobiology.